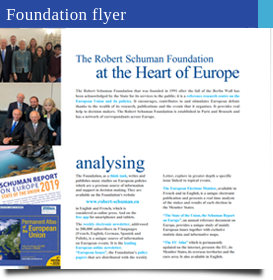 The Robert Schuman Foundation that was founded in 1991 after the fall of the Berlin Wall has been approved by the State for its services to the public; it works to promote the construction of Europe. The Foundation which is a reference research centre develops studies on the European Union and its policies promoting the content of these in France, Europe and elsewhere in the world. It encourages, contributes to and stimulates European debate thanks to the wealth of its research, publications and the organisation of conferences. Read the entire list of the members of the Board of Directors of the Robert Schuman Foundation. Read the entire list of the members of the Scientific Council of the Robert Schuman Foundation. Read the entire list of the members of the Robert Schuman Foundation team. The Chairman of the Robert Schuman Foundation, Jean-Dominique Giuliani, gives his opinion.